On their fourth studio album, and first for their own label, Contra Music (distributed via ArtistDirect/BMG), Gene deliver a laid back, late-night textured pop record with layers of instrumentation with Libertine. The songs are full and earnest, though carry themselves as relaxing, mellow, and sometimes sparse compositions that fill the air with something more than just a feeling of ease. 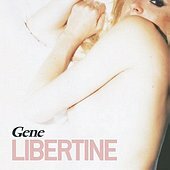 Dressed up pop songs with all the trimmings and an appetite for rocking, but never really going full throttle, preferring to bounce and bop and show you a good time, Libertine is a warm, engaging pop-rock record with a Brit-pop sheen. The songs are strong, the melodies even stronger, and the hooks unforgettable. This is a sonic album that wins you over with songwriting, production, and performance. I'll give it a B+.